Already know me or just wanna skip the pleasantries? Just hit one of the buttons below! Hi my name’s Vincent and Fadawah is the digital agency you were looking for. Whether it’s digital strategy, community management, social media advertising or content creation; I have more than 5 years experience doing all those things for all types of clients ranging from international start-ups to government agencies. My goal with Fadawah is to help brands like yourself or your clients stay ahead of the curve, but also to show them the incredible, and still too often, untapped mobilizing potential of social media. If I can use my skills to get 16,000 Pokémon Go Players in the Zoo of Antwerp and help lead a global fan movement to save my favorite TV-show, imagine what I could do for you! Having done digital strategy for companies & organizations big and small, I know how to turn a briefing into an actionable strategy that includes, objectives, kpi’s, a content calendar and a media plan. If those words don’t mean anything to you, I got you covered as well. Through my job as digital strategist at Friendship, community manager at ANTWERP. POWERED BY CREATIVES., and workshop coach for a number of small and medium businesses I also know how to distill a briefing or tangible goal from a few conversations or workshops. The solution and focus is often already out there; it’s just a matter of asking the proper questions and choosing the right priorities. Pulling out my acting chops for the social campaign movie for Whim💅! Whim is a Finnish mobility-as-a-service service that combines different transportation modes into one app. After successfully upending transportation in Helsinki, they decided in 2018 to introduce their service and philosophy to one of Europe’s most congested cities: Antwerp. As a digital strategist at Friendship, I helped Whim with their digital strategy, user-testing, community management, social and Google ads and content strategy. Together with the rest of the team I helped them successfully launch in Antwerp and got more than 10,000 commuters in Antwerp to use the app. Through projects like Whim, #SaveTheExpanse and my job as community manager at ANTWERP. POWERED BY CREATIVES., I know what makes community tick and what the best way is for brands to approach community management. It certainly isn’t rocket science or brain surgery, but since communities are inherently unpredictable a good strategy makes all the difference. I can help you draft this strategy, connect the different stakeholders, set up the proper platforms and train your existing community manager(s). The Antwerp region has always been rife with creative talent. In fact, some of the world’s best product developers, fashion designers and advertising firms have their roots in Antwerp, but up until recently there wasn’t a community platform or organisation that united them. That changed in 2014 when the city of Antwerp, the province of Antwerp, De Winkelhaak - House of C, UAntwerp, Karel De Grote University College and Antwerp Management School joined forces and founded ANTWERP. POWERED BY CREATIVES. (APBC). As community manager I helped establish this nascent (digital)platform, connected the different creative professionals, organized network events and paved the way for business opportunities in other industries.. I always try to use an integrated approach for all my projects where I cover or try to be involved with all the aspects of the campaign: strategy, creation and advertising. This allows me to craft or brief creative teams more efficiently, but it also helps me gain better insights in campaigns. Moreover, through this approach I can tell what formats work best on social, but also what is feasible to create within a specific budget or time frame. Whether you want to run a brand awareness or app install campaign, I can help you set up ads, optimize them and present the results in a way everyone understands. Over the years I’ve run dozens of successful social ad campaigns for different types of clients including Whim, Mobly, Frisk and Brightfish. The type of campaigns ranged from brand awareness & engagement to app installs and online sales and were tailored to the specific needs and prior online presence of said brands. This means that no matter your budget or experience with social advertising, I can help you get the biggest bang for your buck. The fourth pilar of Fadawah is content creation. 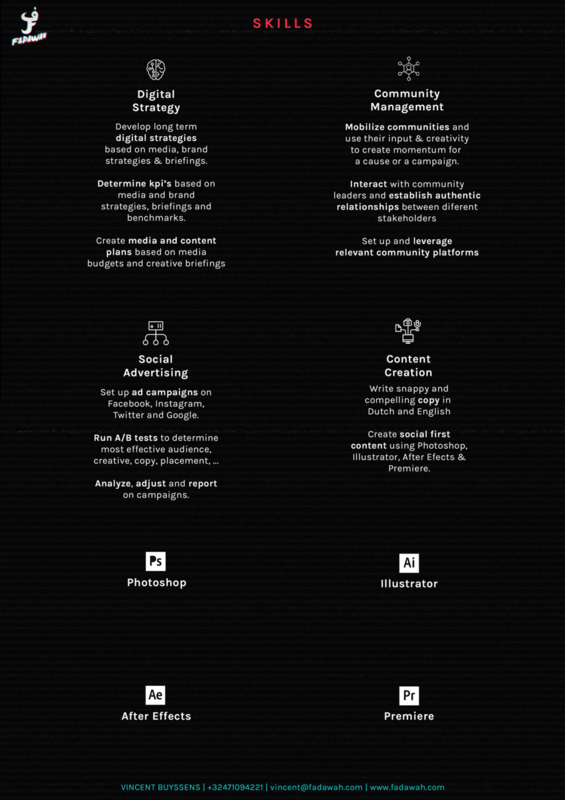 For your brand this means I can both create the social content and draft creative briefings for internal teams or external productions agencies. Thanks to my 5+ years experience working for all kinds of organizations I know when to take lead in the creation phase and when to defer to the expertise of third-parties. Leadership means putting trust in your team and knowing when to delegate . Since video still is and will continue to be the reigning format on social media, I’ve specialized myself in motion design and video editing with a whiff of post-production. I’m not a graphic designer or illustrator, but rather the guy who can turn your branding, assets or campaign elements into social proof content. The animations for Broederlijk Delen below which I made during my tenure at Friendship, for example, are the result of a perfect collaboration between me and the creative team. They made the illustrations and I gave it a social twirl. Social animations for the 2019 campaign of the ngo Broederlijk Delen. Open call movie for the Young Lions Competition organized by Brightfish. By now you should have a pretty good idea of the type of projects I worked on, what my skills are and hopefully how I can help your brand or clients. So, if you’re looking for a hybrid digital marketer to support your team or to help you grow your business, just click one of the two buttons below so we can set up a meeting. I also give workshops and public talks so don’t hesitate to inquire about these options either. Thank you for taking the time to read this article and feel free to check my CV below.